For years we have seen countless Bollywood films drawing inspiration not just from world cinema but also from folk lore and supernatural beliefs, developing story lines that sometime thrill and entertain or even leave you flabbergasted. 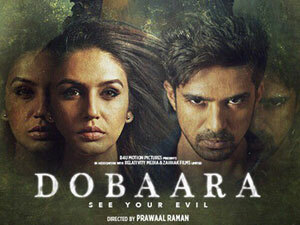 Though there have been numerous films that have focussed on the genre of horror/ thriller that hit screens over the past years, this week we see the release of the horror film, DOBAARA: SEE YOUR EVIL, which is an official adaptation of a western horror flick Oculus that was well received. But will the Indianised version live upto expectations…is what we analyse. First off, it isn’t easy making a film that deals with multiple dimensions and time lines, leave alone one that deals with supernatural beings terrorising people from a different plane altogether. However, like the original film OCULUS, DOBAARA focuses on exactly this, with the main protagonists Kabir Alex Merchant and Natasha Alex Merchant played by the real life brother sister duo of Saquib Saleem and Huma Qureshi, who find themselves doubting everything and being unable to clearly define the real from the surreal. The film starts off with Kabir and Natasha’s parents Alex Merchant (Adil Hussain) and Lisa Merchant (Lisa Ray) who find themselves being driven apart by an unseen force, that has seduced Alex making him shun his family. Despite Lisa’s repeated attempts, Alex distances himself from his family, until one day he decides that they need to die. While Lisa is shot and killed by Alex, a young Kabir manages to disarm his father and hold him at gunpoint. Facing a loaded weapon, Alex has a moment of clarity wherein he realizes what he has done and forces Kabir to pull the trigger. Soon after the police arrive, Kabir is taken away to an institution, where he spends the next ten years coming to grip with what happened that fateful night. In the meantime, Natasha grows up with the sole objective to prove the supernatural power of the mirror before eventually destroying it. Will the duo manage to prove the horrifying tale of death that has followed the mirror? Will they succumb to the terrors the mirror induces? Will Natasha be able to destroy the mirror or will it destroy them is what forms the rest of the film. When it released, OCULUS turned out to be a rather path breaking film in the horror thriller genre which gradually builds up on the story revealing details as the film progress. However, in the case of DOBAARA, much of the story line is already known, which lends the viewer a sense of been there done that. But, despite this director Prawaal Raman undertakes the task of unravelling a horror mystery layer by layer as the film progresses. Sadly DOBAARA suffers from the same disease that plagues Indian horror films. Unfortunately despite the fact that the film could have been a stand out experience in this genre, it falters due to a rather underdeveloped screenplay and characterization. In fact, the first half of the film ends up being rather slow, with the progression on screen taking place at a snail’s pace. If that wasn’t all, each time the suspense builds up with the the audience expecting something to happen, the scene changes leaving the viewer in free fall. This sudden switching though acts as a roller coaster ride, becoming tiresome after a point. However, though the second half of the film does pick up in pace, sadly, the dual time lines and the constant switching back and forth leave the viewer disoriented and confused. With the duality of timelines and the never ending roller coaster ride, the audience eventually loses interest in the plot and keeps waiting for something to happen. Coming to the performances, Adil Hussain proves yet again that he is an outstanding character actor. Given the limited scope of a horror film wherein his role is rather limited to that of a man possessed, Adil still manages to shine leaving a lasting impression of a loving father initially, and later as a man who has been hypnotised. His moment of clarity towards the end is well emoted. Lisa Ray as Lisa Merchant is decent as the mother who is terrorised by her husband. However, her character comes across as severely under developed lacking depth and relatability. Saqib as the Kabir who has now come to terms with reality and refuses to believe in all things supernatural is good. But there are a few times when his performance comes across as forced and overtly negative. Similarly, Huma does an agreeable job with the character of Natasha, a girl set on proving that an object has supernatural powers. But considering that the film focuses more on the mirror being the main antagonist, both Saqib and Huma’s roles come across as supporting characters in a plot that is driven by an inanimate object. Talking about direction, director Prawaal Raman, who has in the past given us films like, DARNA MANA HAI, GAYAB, DARNA ZAROORI HAI and 404: ERROR NOT FOUND seems to have lost the plot with this one. Prawal doesn’t seem to know what he is doing with the already flawed script that keeps getting dragged despite being just about 100 minutes long. In fact, given that the film deals with the genre of horror, Raman had the opportunity to use lighting and camera angles to evoke fear while simultaneously also displaying the plight of the onscreen characters. Unfortunately Raman miscarries this with most of the scares, though few and far between, coming via the tried and tested jump scare technique that gives the film a very dated feel. Anuj Dhawan takes care of the film’s cinematography, but given the fact that the film is set within a house, cinematic liberty to take in wider visuals is non-existent. However, in DOBAARA, the cinematography is at best average with Anuj trying his level best to use the tight angles on staircases and under use of halogen lights to create a sense of eerie spookiness. With both direction and cinematography unable to boost the film, belonging to the horror genre, it falls to the background score that usually ends up setting the pace. Unfortunately, here too DOBAARA underperforms. Arko Mukherjee and Samira Koppikar despite helming the audio department rely heavily on the tired and tested audio intonations that build at climax as the plot traverses its roller coaster line. Sadly, there isn’t much to expect from the background score that gets lost. On the whole, the essence of DOBAARA: SEE YOUR EVIL being a psychological thriller set in the horror genre doesn’t come across and is limited to a few scenes. At the box office, facing a cluttered weekend with multiple releases, it will be an ordinary fare.